Ophiopogon planiscapus growing herbaceous rhizomes of the genus Ophiopogon also known as Black mondo grass, Ophiopogon planiscapus perennial evergreen plant, used as ornamental plant and groundcover plant, can grow in temperate, mediterranean or subtropical climate and growing in hardiness zone 6-10. Leaves color green to purple-black in linear shape. Flower color purple to white in bell shape, flowers grows on top of the stems in clusters. 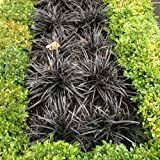 (6 Plants Classsic Pint) Ophiopogon planiscapus Arabicus Black Mondo Grass is an Evergreen Ground Cover with Near Black, ¼" Wide Leaf Blades. 5 seeds of Ophiopogon planiscapus Nigrescens BLACK MONDO GRASS Seeds! (12 Plants Classsic Pint) Ophiopogon planiscapus Arabicus Black Mondo Grass is an Evergreen Ground Cover with Near Black, ¼" Wide Leaf Blades. Ophiopogon planiscapus Nigrescens Black Mondo Grass Seeds! 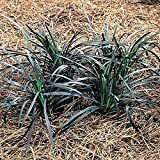 (25 Plants Classsic Pint) Ophiopogon planiscapus Arabicus Black Mondo Grass is an Evergreen Ground Cover with Near Black, ¼" Wide Leaf Blades.